Penn Manor parents and students are encouraged to attend the free presentation “(Re)Defining the Goal: Providing True Career Readiness” on Wednesday, Feb. 15 at 6:30 p.m. at Lancaster County Convention Center. 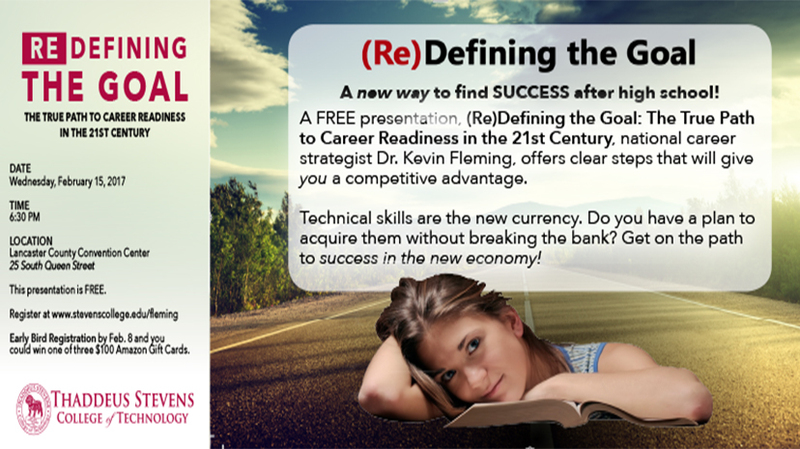 Kevin Fleming, an expert on postsecondary planning and career readiness, will provide useful information for parents and students beginning to contemplate life after high school — whether that involves work, training or college. The program will be held in the Commonwealth Room on the second level of the convention center. Parking is available in the Penn Square Garage or on the street at no charge after 6 p.m. The presentation is hosted by Thaddeus Stevens College of Technology, IU-13 and the Lancaster Chamber of Commerce & Industry. As an added incentive, Thaddeus Stevens is giving away three three full-tuition scholarships to students who attend the event. There is no admission charge, but pre-registration is preferred. Anyone who registers before Feb. 8 will be eligible to win one of three $100 Amazon gift cards.